Mobile urban prehistory, the kind you can find in your garden, then display on your mantelpiece, has not featured much in my blog to date. Most urban prehistory has already been found and taken away, or is too big and awkward (i.e. a standing stone) to act as an ornament in anything but the most splendid of houses. When innocent parties do stumble upon objects which may be of great antiquity they usually take them to a local museum for identification, and then they become lost in the mists of time / store rooms / filed in the bin. But one examples stands out, where this didn’t happen. Over a few posts, I want to recount one of the most remarkable and controversial examples of urban prehistory that I can think of – the story of the Hexham Heads. Even if you have heard this one before, it is a great story. These frankly weird objects were found in a normal garden in northern England by two boys belonging to an unremarkable family. Consisting of a pair of fist-sized stone heads with creepy little faces, what seemed like a chance and even amusing discovery soon spiralled out of control. Events quickly escalated until museums, archaeologists, geologists, the media and various pseudoscientists all wanted a piece of the action. The Heads were scrutinised and sampled; they were boxed up and taken to the other end of the country; they gathered an aura of the supernatural and even notoriety. But slowly interest waned, and then eventually in circumstances shrouded in mystery, they were lost. And it would be remiss of me not to note that somewhere along the way a ‘were-creature’ appears to have started to haunt some of those brave enough to keep possession of the Heads. The Hexham Heads represent urban prehistory that might not even be urban prehistory (they may have been made in the 1950s BC or AD), and yet their discovery and subsequent contestation mirrors very well how archaeologists deal with any bit of material culture found during a formal excavation. The methodical and measured contributions by most (but not all) scientists involved ensure this to be the case. But what makes this an especially weird story is that it also draws on other tropes of archaeology – the cursed objects, dealing within things we cannot comprehend, sinister stones, arcane rites. And, at the risk of cursing myself (if such a thing is possible) I have visited the place where the Heads were found, the tale of which conclude the story of the Hexham Heads in a later post. The date and circumstances of discovery does not really matter, which is just as well as published accounts vary on little details such as when and how the Heads were found. It might have been 1971 or 1972 when two young boys found the Hexham Heads in their back garden at 3 Rede Avenue, in the town of Hexham. The boys may have been weeding, or clearing vegetation, or even digging down into the earth. Whatever. In quick succession, they discovered a Head each, a nice symmetry. 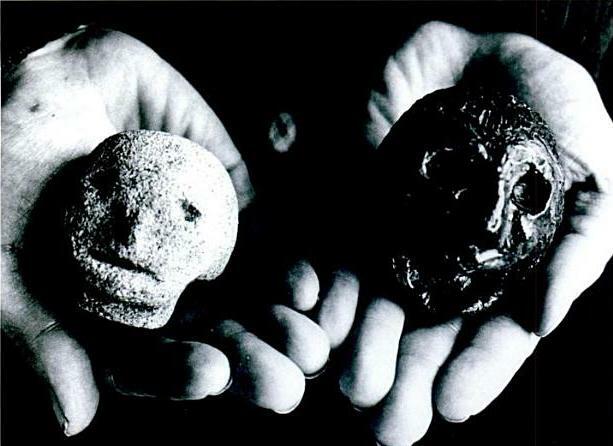 The objects appeared to be made of stone, a pair of faintly grotesque little things. Both objects were roughly spherical in form, both with some kind of protrusion from the neck that suggests they were once joined to something else, maybe a little body or a pedestal. Those who have held the Heads quite literally in the palms of their hands have given varied and colourful descriptions of the objects. Accounts differ as to the size of the Heads depending on which source of information you read – from ‘tennis ball’ down to ‘small tangerine’. Facial descriptions of these little carved stone balls have tended to centre of the apparently gendered characteristics of the two objects and some assumptions that have been drawn from their facial expressions. Paul Screeton has written in his detailed if meandering 2010 book Quest for the Hexham Heads that one was known as ‘the boy’, with ‘hair modelled in stripes, running from front to back’. The other is treated less favourably in Hexham Heads literature, dubbed (depending on the source) as the girl, old woman or ‘hag’, whose characteristics include ‘wildly-bulging eyes’ and, according to Don Robins, ‘a strong beaked nose’. It is unclear if the attribution of these negative characteristics associated with the ‘female’ head were formed before, or after, the supernatural events that are reported to have happened soon after these objects were discovered. Events took mysterious and bizarre turns during the time that the objects were kept at the home of the finders and that of their neighbours in the same semi-detached house. The Heads were thought to rotate during the night to ‘look’ in certain directions come morning time. Stuff happened that in other circumstances would be attributed to a poltergeist. And one night, an event occurred which could be described as eldritch occurred. The neighbour, a Mrs Dodds, awoke to be faced with an unusual house guest: a half-sheep, half-human creature in her bedroom, which turned and ‘padded’ downstairs and out of the front door when she saw it. This would not be the first hybrid being conjured up by the heads, as we shall see further into the story. Did the creature summoned by the heads look like this bad boy, except with a sheep’s head? But however much I would love to imagine a sheep having undergone therianthropy loping around Hexham in the early 1970s, another explanation seems more reasonable. In an article about the Heads from Fortean Times 294 (November 2012) Stuart Ferrol noted a tale he heard locally of a prank that very same night that involved a drunk with a stolen sheep carcass on his back (taken from a nearby abattoir) staggering up Rede Avenue. 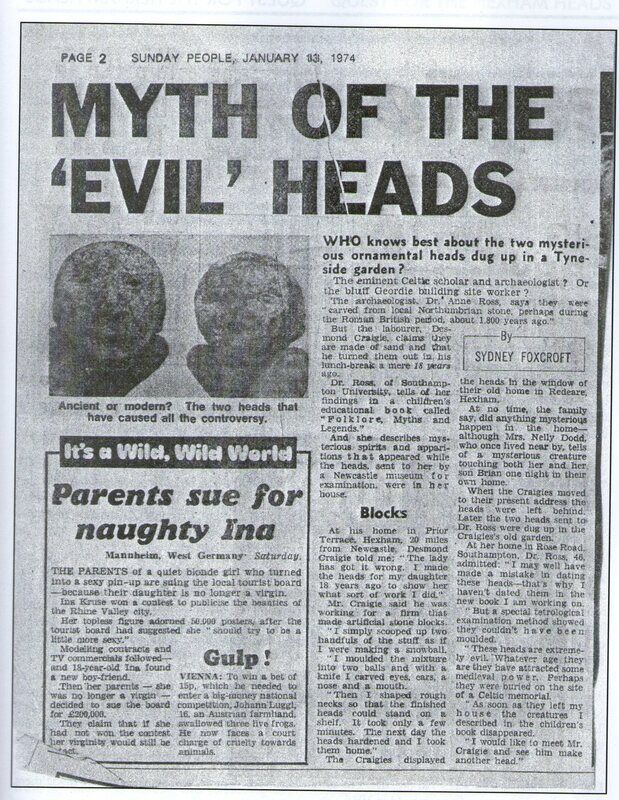 Regardless of what happened that night, events surrounding the Heads became known locally and in the press, and the Heads from that point onwards developed an aura of mystery and danger –they were often described in 1970s TV and newspaper media accounts as ‘evil’. The Heads were soon on the move, cleared out of the house and handed into Hexham Abbey for professional interpretation (not to be exorcised I assume). At times they were also in the care of the Museum of Antiquities at Newcastle University, and ended up in Southampton for a while as well. During the next couple of years, in other words, they were poked and prodded and sampled by a range of experts, but no real consensus was reached as to what material they were made from, or even whether they were genuine ancient relics or not. ‘I made them – about 16 years ago. I made the heads from bits of stone and mortar simply to amuse my daughter when she was a little girl. I actually made three but one appears to have got lost. They were out in the garden for years. I definitely made them. I have been laughing my head off about these heads and I cannot understand why all this attention is being paid to them’. He then made a couple more to show he could do it, from ‘local stone, sand and water’ although they were even more rubbish looking than the originals. Bombshell indeed! This was all the more shocking as archaeologists and academics had not identified the possibility that the Heads were in fact little more than rather disturbing cement toys made in the late 1950s. Such are the perils of urban prehistory – sometimes the prehistory is more urban than it is prehistory. Sources: The story of the Hexham Heads has been recounted in most detail by Paul Screeton in his book Quest for the Hexham Heads (Fortean Words 2010) and in Don Robins’s 1988 book The secret language of stone; both books were consulted in the preparation of this post. 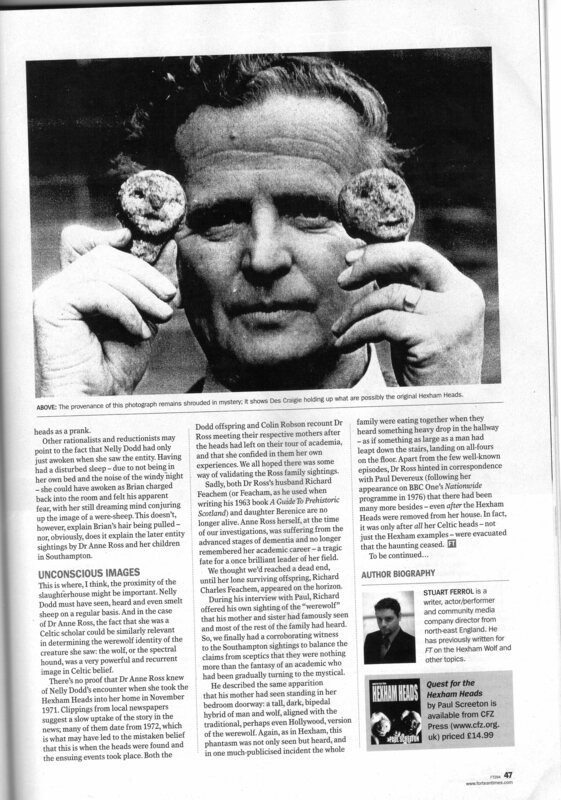 Stuart Ferrol’s Fortean Times articles (294/295) were also helpful. The newsclipping was sourced from Screeton’s book, while the top picture of the Heads – and the hands holding the ‘fake’ heads – are available widely online. 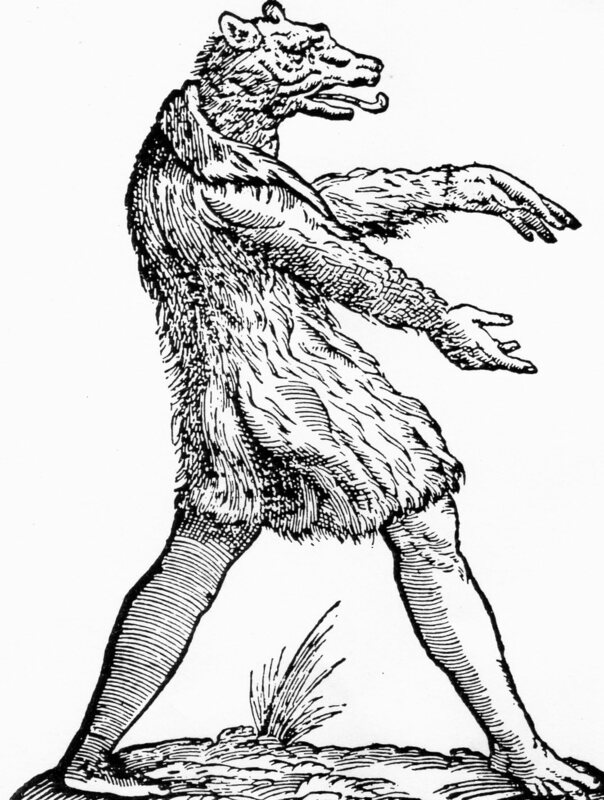 This blog was edited on 31st January to add the sketch of the werewolf, sourced from a chapter on the Hexham Heads in the book ‘The unexplained file. Incredible phenomena’ (1984). This was kindly supplied to me from the eclectic and occult library of Drew Mulholland. A post concerning the fragmentation of a prehistoric monument by a road junction and subsequent, unrelated protests, which in turn leads to an association with an altogether more modern monolith elsewhere. Driving out of Auchterarder, something didn’t add up. Geometrically feasible – but unusual. 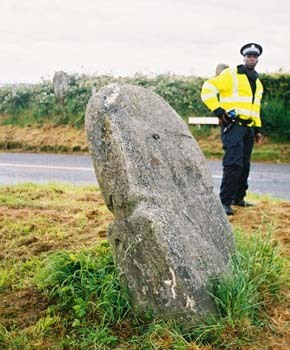 The coincidence of a megalithic monument at a place that subsequently became a road junction – not a coincidence. The desolation of a megalith in the name of progress – typical. Last week, on a visit to Perthshire on entirely unrelated prehistoric business, I made a detour to the ‘lang toun’ (translation: the long town), Auchterarder, to visit one of the more obscure exits from the town on its northwestern fringe. (Wikipedia claims that in the ‘Middle Ages’, this town was known ‘in Europe’ as ‘the town of 100 drawbridges’ which sounds an unlikely claim in so many different ways.) 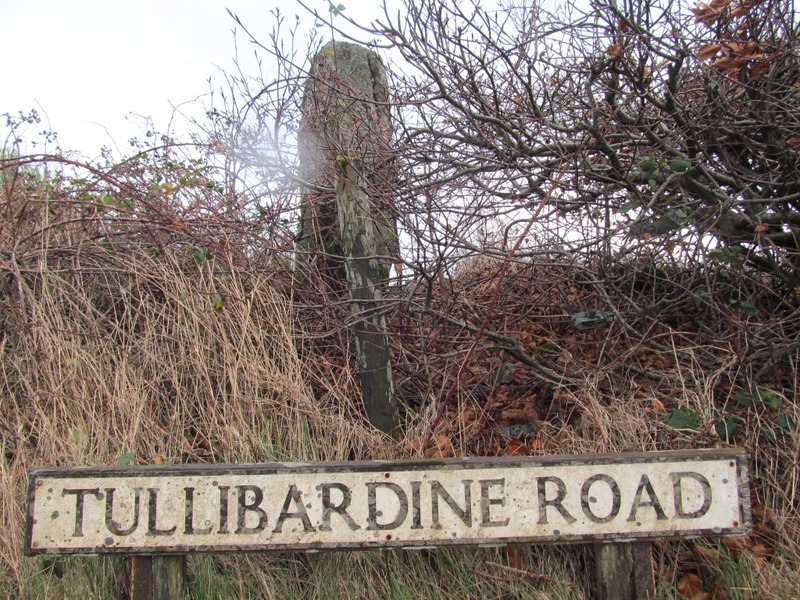 Here, where Easthill Road meets Tullibardine Road, one can drive through what was a stone setting that made sense and had some internal coherence once upon a time. Now it makes little sense, with one rather ugly megalith stranded in a weird triangular traffic island, and two other megaliths built into a substantial field boundary across the road to the east. Houses overlook the stone setting, and cars and lorries rumble past from time to time. 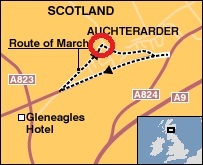 The site is known as Easthill, with NMRS number NN91SW 7. As with so many of these sites, almost nothing is known of this monument. It does appear on the 1st edition map from the 19th century, by then already bisected by this little junction, although the southern side of the triangular traffic island did not then exist, given the lack of traffic that would have been on the road at the time and the lack of requirement for turning space. A fine group of stones, two only of which are now standing, on the summit of what has been a well-defined mound, which has been cut through by the road [my emphasis]. Hutchison noted other stones lying in the vicinity which he thought might have belonged to a larger stone setting, the only two stones still erect being the large blocks set into the field bank at the road side. 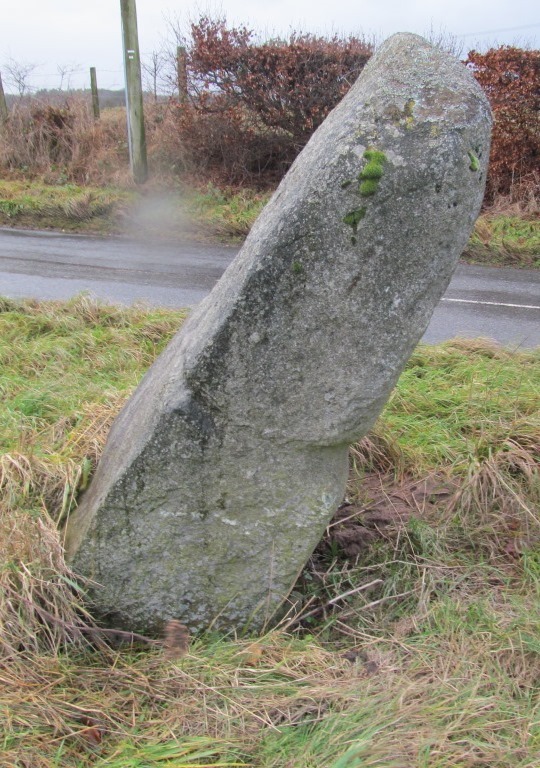 The third stone which now stands in the traffic island was described by Hutchison as being recumbent at the time of his visit: he noted a ‘groove’ running right around it, which is still visible on this megalith. Indeed, it does not even seem to have been standing when Ordnance Survey archaeologists visited the site in 1967; at that time it was noted that two fallen standing stones lay prostrate in the middle of the junction, almost entirely covered by vegetation. The middle-of-the-road megalith is indeed a peculiar standing stone, set at a jaunty angle with the impression of being about to fall over at all times. The small mercy to be thankful for is that they have not been broken up altogether and used for road metal. This has probably been due to the circumstances that one of these stones has a curious encircling groove running round it, which perhaps impressed even the vandal roadmakers with the idea that it might be worthy of preservation. 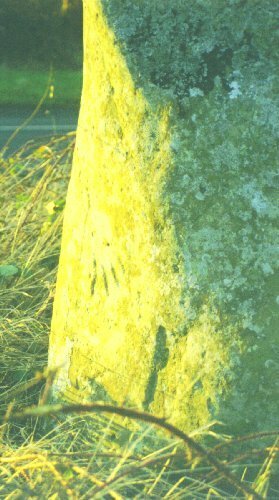 It has also been suggested by some visitors that a handprint has been carved into one of the roadside standing stones, although this was difficult to verify due to the dense vegetation around both of these monoliths; the image below suggests to me that again this is not an original feature of the standing stone being far too fresh looking. This is a monument that has been monkeyed about with quite substantially in the last few centuries, and ended up in a rather dangerous and dispiriting location. In prehistory it may have been, to use the jargon, a four-poster, that is, a square setting defined by four standing stones, one at each corner. These generally date to the late Neolithic or early Bronze Age, and were probably a variant on the stone setting, perhaps with hints of house architecture (timber equivalents are usually thought to be the internal framework for a round house.) Both Hutchison and the OS fieldworkers note four stones in this location, although it is impossible to tell if the stone within the traffic island originally stood where it now does, or where the fourth stone was located; this may well not even have been a square setting. The mound has been largely ploughed to oblivion, but some strategic fieldwork here could probably shed some light on the original form of this monument if anyone out there is at a loose end. While googling around for information and stories about this monument, I came across some great images of the standing stones during the G8 summit that was held in the nearby fancy hotel and golf complex of Gleneagles. This gathering of ‘eight men meeting in the hotel’ (as George Galloway characterised it) took place in July 2005 and was met with substantial protest and resistance around the fringes of the event, largely peaceful, focused along the edges of a lengthy perimeter fence set up by police. 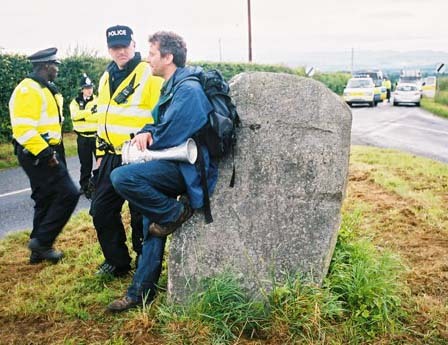 The stone setting was in fact on the route of the ‘G8 Alternatives’ march and some of the protesters tarried there for a while, one megaphone-bearing guy using the stone as a prop to lean on, the groove proving useful as a footrest. protestors, nor is it remembered as having any particular significance amidst the events of those few days in summer nine years ago. But for another protest on another road, a standing stone was actually erected to memorialise the event – at Twyford Down in Hampshire. 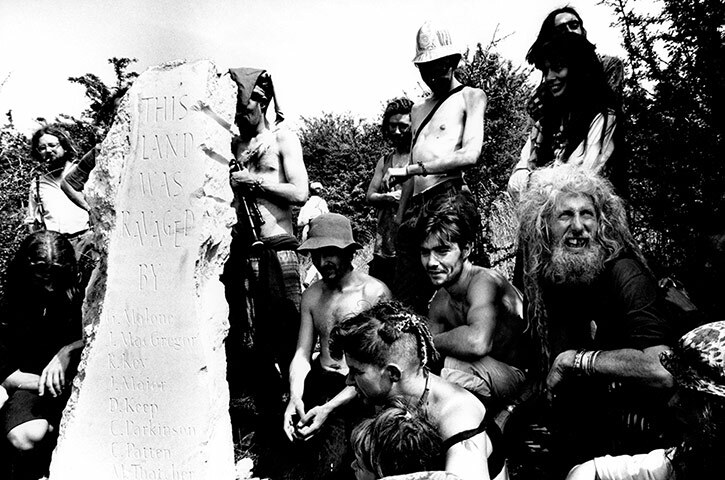 The chalk monolith at Twyford Down was set up by road protestors after the famous anti-road demonstrations that took place here in the early 1990s. 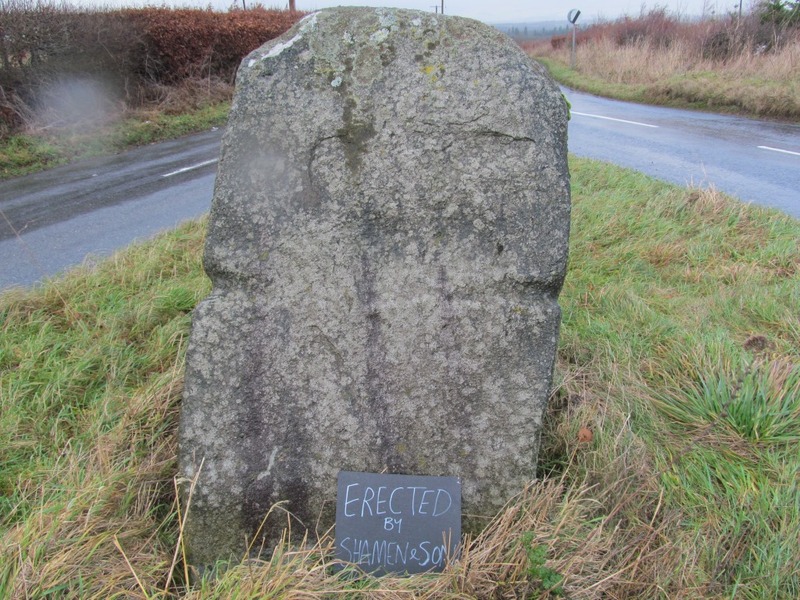 The story of this standing stone, and current debates about its future, are brilliantly documented in John Schofield’s book Aftermath (Springer, 2011). Protests focused on the construction of the Winchester Bypass M3 extension through a huge cutting on Twyford Down, right next to an Iron Age hillfort. Road protestors camped in the location, and daubed slogans on a footbridge constructed across the new motorway; they also occupied heavy machinery and construction areas, and generally got in the way of things, although in the end this did not stop the road being constructed. Rather like a prehistoric monolith, this off-white standing stone represents people, events and the land. The stone memorialises these events from the protestors’ point of view. It is made from the same material that most of this chalkland consists of. But it is not prehistoric, because it has writing on it. This is a list of people who the protestors felt were responsible for the construction of the M3, the creation of the cutting, and the permanent alteration of the landscape as they saw it. The engraving starts This land was ravaged by and was followed by a list of names, including, inevitably, M Thatcher as well as PM at the time, J Major. Schofield offers a balanced discussion of the current status of this standing stone, which is vulnerable because of its youth. For some, it is a valuable and legitimate monument that informs and reminds people about an important cultural event, namely the anti-road protests (and there were many of these in the 1990s). For others, it has little status as anything other than a very modern piece of nonsense. It has not been included in the Scheduled Monument Area here. Yet, as Schofield has argued, the monolith is ‘inevitably and unquestionably part of this landscape’, as much an archaeological entity as the hillfort and the motorway cutting itself. 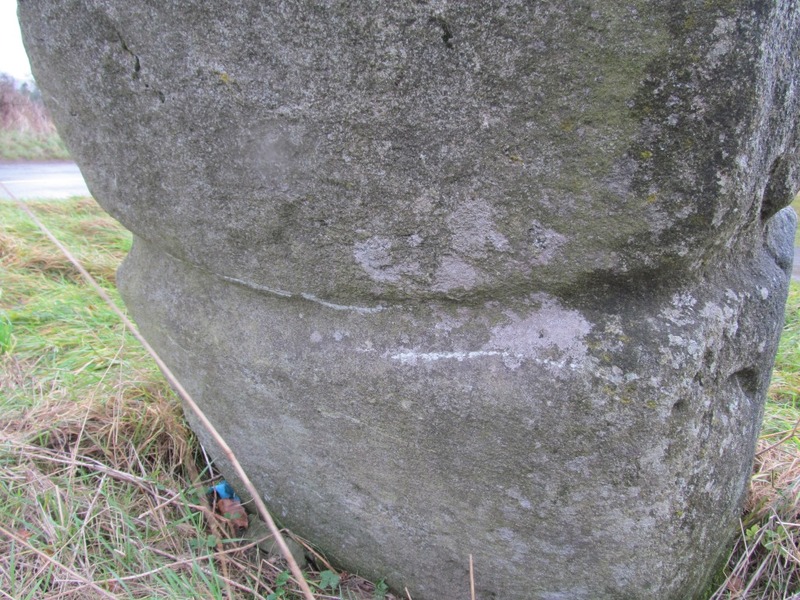 Does it matter when standing stones were erected – or who did it? 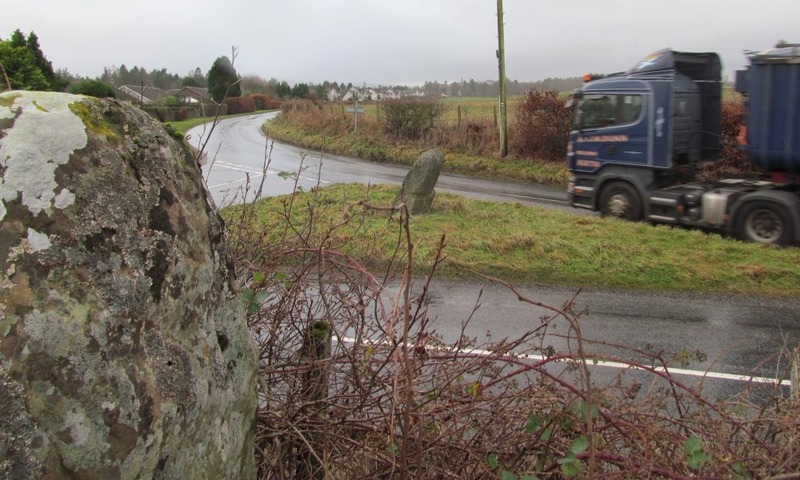 This post started with an account of my visit to an obscure set of standing stones in Perthshire, but has finished on a reflection about the status and nature of standing stones (again!). I suppose in essence the problem with how to make sense of Easthill, and decisions about the future of the Twyford monolith, revolve around the same thing. 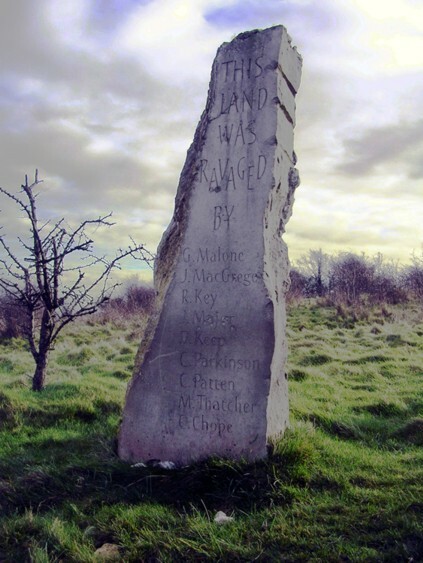 At what stage – how long ago – must a standing stone have been erected for it to have protected status, to be regarded as ‘authentic’, to be taken seriously, to be interpretable? Does this have to be in the ancient, distant past, when frankly everything that was ever known about the monument has been forgotten? Or could it actually be in the recent past, when the standing stone actually still has a place within the memories of living people? In fact, this is complicated, because many of the standing stones we regard as authentically ancient, from Stonehenge to Orkney, or many of the Dartmoor stone rows, were – like the middle-of-the-road megalith at Aucherarder – re-erected in the last century or so. If only Neolithic and Bronze Age people had carved stories, names, dates, onto their standing stones, how much easier it would be to make sense of them. Sources: There is a nice blog post on this monument by the Northern Antiquarian which I recommend you have a look at, much more detailed than mine! I sourced a few images online for this blog, from various locations. 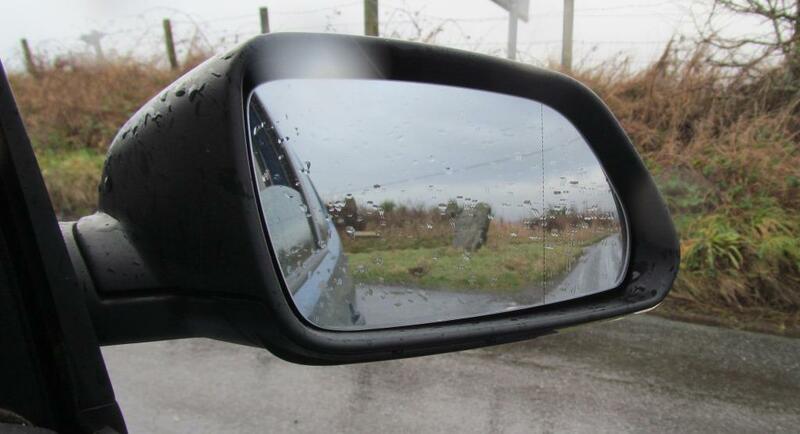 The image of the handprint comes from Martin McCarthy’s nice little webpage for the Easthill stone setting, where he questions the sanity of the road designers. The G8 photos were uploaded to The Modern Antiquarian website by Matt Saywell; the Twyford monolith image was posted by Jim Champion on the Megalithic Portal. 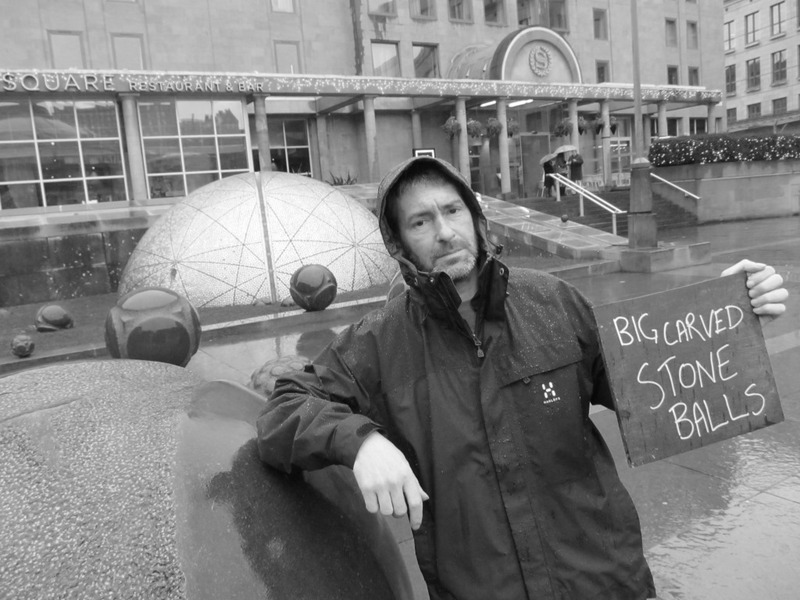 Images of protest near Gleneagles are availably widely online, while the Twyford protest pic with the monolith came from a recent Guardian photo special on the protests. The wee map was sourced from the BBC webpages about the G8 summit, linked to in the post itself. Wet and windy, cold and dreary, another storm. We headed from Haymarket Station in Edinburgh on one of the final days of 2013. 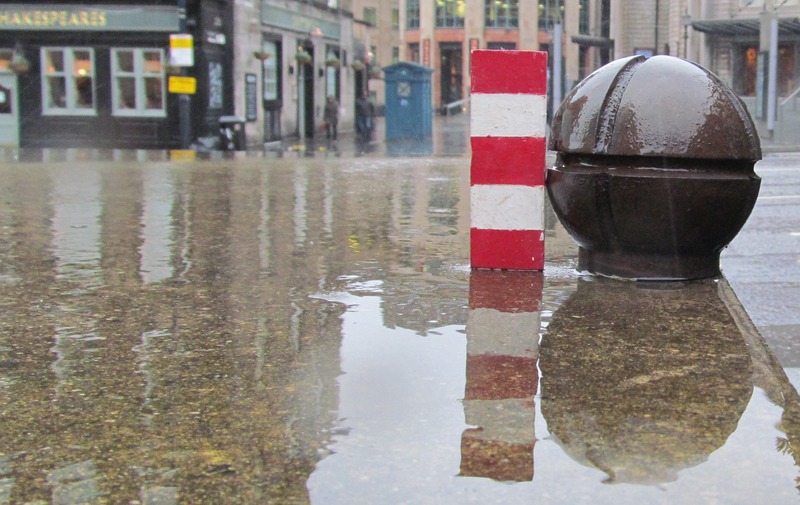 We are wet and cold, walking towards the Grassmarket, heading for Festival Square to encounter some spherical urban prehistory. Looking for things made from limestone, granite, stainless steel, bronze, cement, water, light, coins, ball bearings. And we are not disappointed. Rounding the corner into the Square, which sits outside the Edinburgh International Conference Centre, the Sheraton Hotel, and some bars and restaurants, we get our first glimpse of what is to come, in the form of tiny brass balls with geometrical patterns, jutting from walls and plinths, for what purpose we could not tell. Then we saw across the square an assemblage of spherical objects of varying sizes and materials, from quite tiny to rather huge. Taken together, this ‘ball array’ is a sculpture which consists of an apparently random grouping of at least 18 spheres, some of which have the impression of being partially submerged within grass (of this, more later). 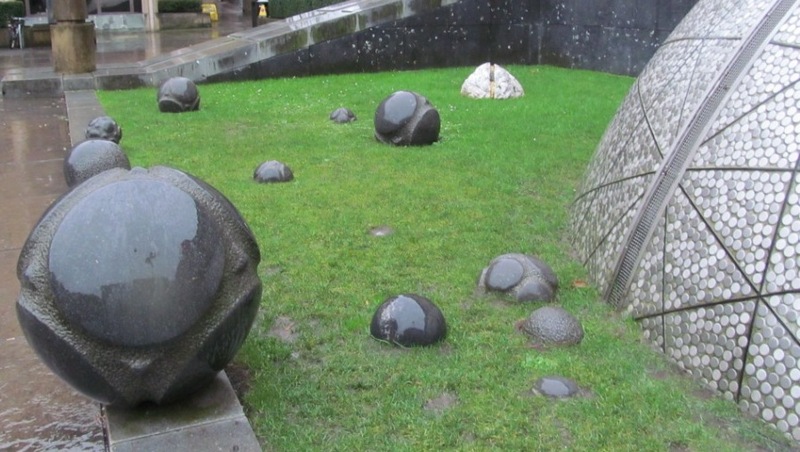 Balanced on paving stones away from the grass are some of the largest balls, of varying sizes and designs. 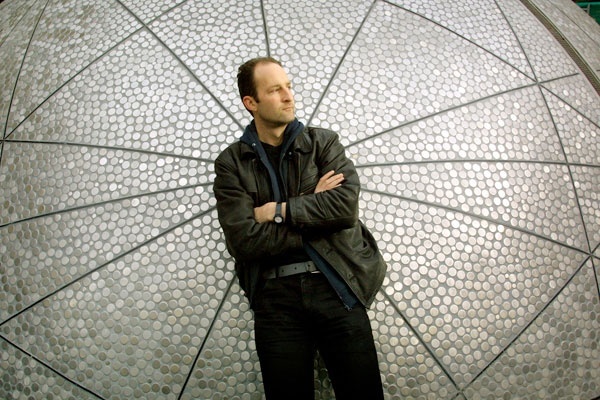 The backdrop is a massive glassy globe, a sort of greenhouse covered in tiny silvery circles. One peculiar quartz block amongst the balls is an approximation of a spherical form, a little white standing stone. These balls have the superficial appearance of carved stone balls, a Neolithic form of material culture that has faintly bothered archaeologists for over a century, and provoked many wild and wonderful theories from others throughout the same period of time. And as we shall see, these enigmatic stone objects have inspired other recent ventures. Ancient carved stone believed to have been formed during the neolithic period have been found throughout Scotland. There are many theories surrounding their possible origin and purpose. They remain a uniquely Scottish mystery that continues to inspire thousands of years later and have been the artist’s inspiration for this artwork. The stone really has two inspirations, the first is the actual shape and design of the stone and the second is the spirit of kindness which the stone embodies and symbolizes. The shape of the stone is actually inspired by stone orbs that were sculpted by the neolithic peoples who lived in the northeast of Scotland. What is intriguing about these stones is that nobody knows what they were used for or what they could possibly symbolize. The idea is that the Sconestone is passed from person to person, with each keeper carrying out an act of kindness, before passing the stone onto someone else, and in the past four years this spherical object has crossed the world and had many keepers. 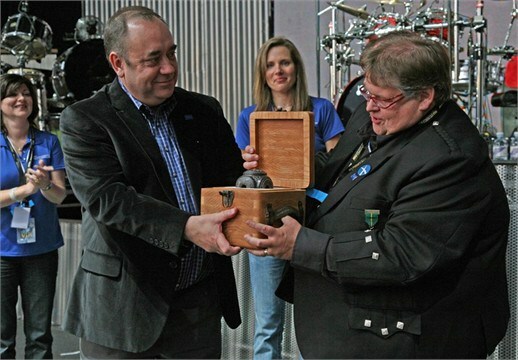 In a stramash of Scottishness one could hardly make up, this stone was launched upon the public by Alex Salmond at a Runrig concert in August 2009 at Scone Palace. The First Minister was happy to support this project, and object, noting at its launch that this ‘initiative can help inspire many people around the globe, while also highlighting Scotland’s ancient heritage and close ties with Canada and other nations of the world’. Yet how on earth can we take the basic premise of a 5000 year old form of material culture and then use this as part of the identity of a modern nation state, or representative of some rather woolly modern concept like kindness? Perhaps stone balls were actually used to hit people over the head with – we have lots of examples of Neolithic people in tombs with serious cranial injuries. And there was no such thing as Scotland (or the Celts) in 3000BC. Perhaps we should draw on some other aspect of the carved stone balls: their otherness, their ambiguity, their beauty. The lack of meaning – we have no idea really what they were used for – could be viewed as a failing on the part of archaeologists. I don’t think this is the case, but I do think First Conundrum offers a really nice way of encouraging wider engagement with carved stone balls, which can be no bad thing. And they have inspired other artists as well, notably Loiuse Tait, whose series Speaking Stones renders carved stone balls in glass. 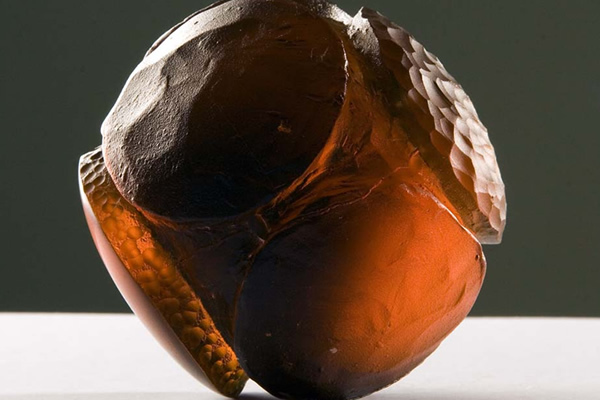 This spectacular series of colourful glass objects highlights the tactile and powerful nature of carved stone balls, but also reflects the weakness of the ways that archaeologists often deal with such ancient objects. On her website she has noted: ‘The stones are made from glass rather than barricaded behind it’. 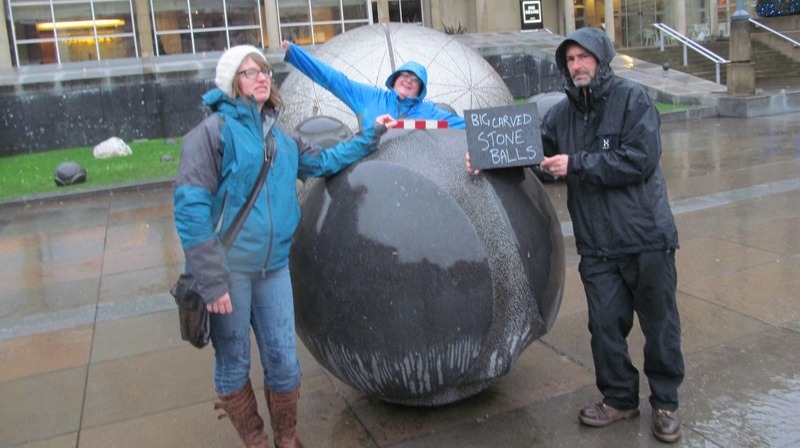 So, outside a bar and hotel entrance in Edinburgh, the general public (and publicity hungry actors) have a chance to touch and even climb all over carved metal balls, and so engage with the enigma of carved stone balls: this is a place where a lot of people gather. And again I think it is the aesthetic qualities of the stone balls that are to the fore; the focus seems to be on the designs and patterns, not the reality of the CSBs, which are all of course much smaller than any of the balls on show. 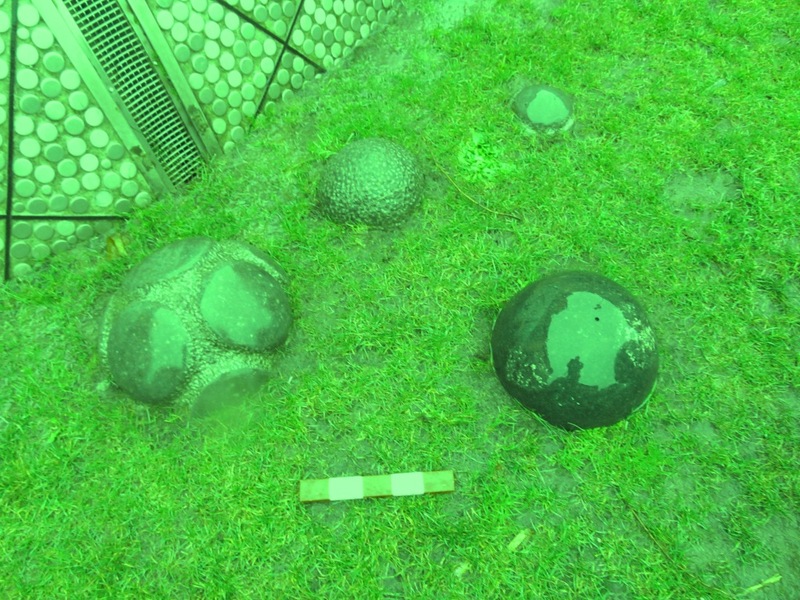 In fact, the average diameter of the Neolithic stone balls is something like 7cm although they are by no means identical in size (the variability in size of the Neolithic stone balls is played out in an exaggerated way in the sculpture). The original Neolithic balls probably date to the 3rd millennium BC, perhaps a bit earlier. 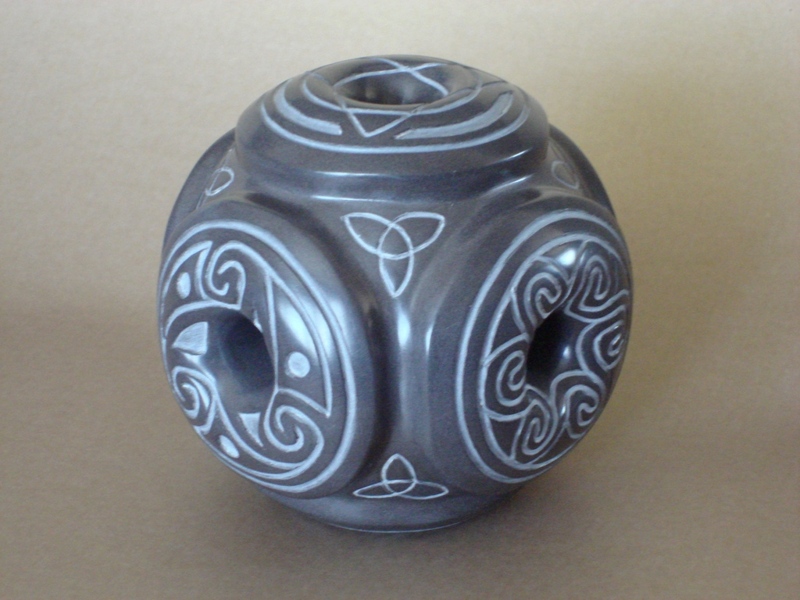 Over 400 have been found in Scotland, and they represent a wide range of forms in terms of decoration and ball shape. Most have been found in Aberdeenshire, suggesting a local tradition with a wide sphere (excuse pun) of influence. Attempts to classify them according to design and form, for instance by Dorothy Marshall in the 1970s, have foundered in the sniggering form of undergraduate students trying to establish the significance of the number of ‘knobs’ on each ball. Their function is, as already mentioned, the subject of much discussion, with the most authoritative modern accounts written by Mark Edmonds (in 1992) and Gavin MacGregor (1999) focusing on the social and tactile properties of the balls, rather than endlessly speculating on what Neolithic people might have used these things for. The spiral designs, and the number of knobs, are unlikely to ever be intelligible to us; holding them in the palm of one’s hand (where they fit very comfortably) helps make much more sense of the balls. 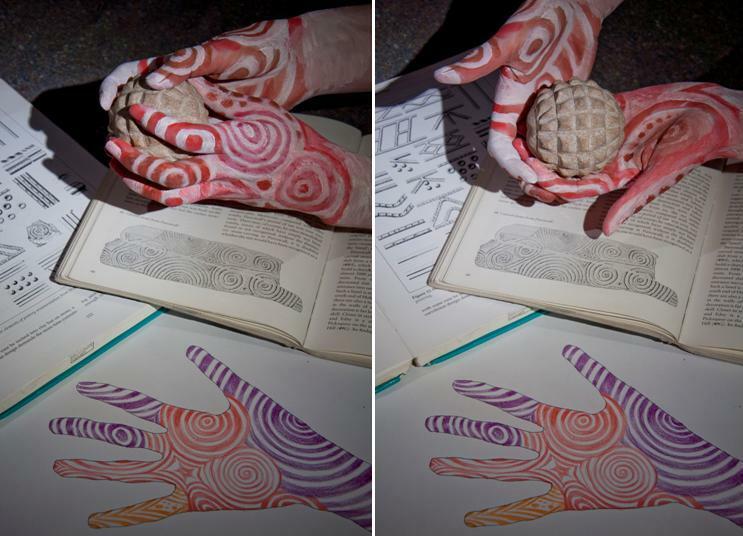 This is illustrated brilliantly by Alice Watterson and Aaron Watson’s images and video of a carved stone ball being rubbed and passed from painted hand to painted hand within a late Neolithic house at Skara Brae: these were objects that could become part of people. 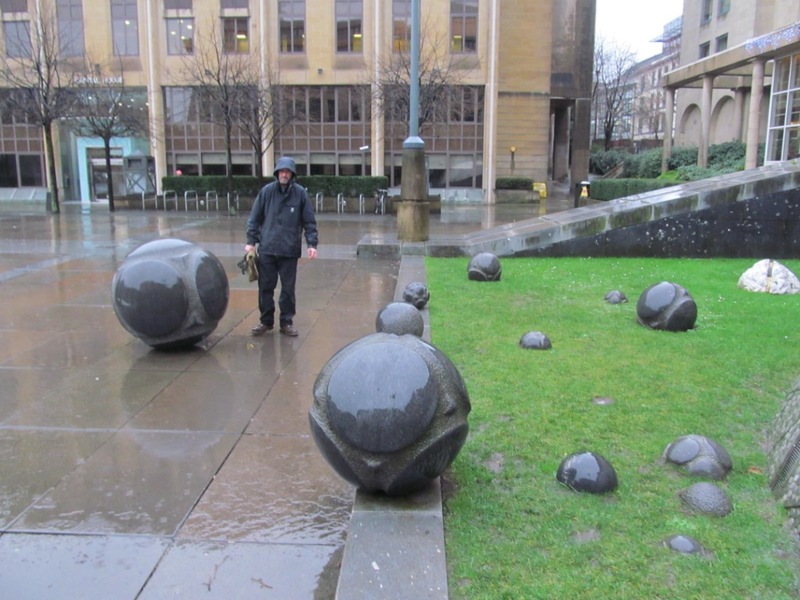 An excellent and measured survey of the balls also appears in the recently published Scottish Archaeological Research Framework (ScARF) document, which focuses on the carved stone balls as objects of personal power. Rather surprisingly, however, ScARF suggests: ‘The fact that they are frequently described as ‘mysterious’ is unhelpful’. Yet the creative responses to stone balls discussed in this post were both inspired by mystery, and perhaps a sense of wonder. And these are powerful tools to help us make sense of the past. Like so many instances of urban prehistory, First Conundrum’s array of carved balls and associated objects no longer reflects the intentions of the artist who created them. Because in its initial incarnation this was actually a water installation, a fountain – de Fouw characterised it as an open / water feature. Thus the metal balls partially submerged in grass were once partly underwater. I am not sure when the pond at the base of the largest sphere was replaced with grass, but this seems to me to have removed a lot of the dynamism from this installation. The fountain was actually a fan of water that grew and reduced in a ten minute cycle. Now the stones only get wet when it rains, which as it happens was evident in abundance during our recent visit. Yet dynamism still exists – the largest of the balls seem to be attached to the ground by nothing very much, and it is almost surprising when the big balls fail to roll when pushed. 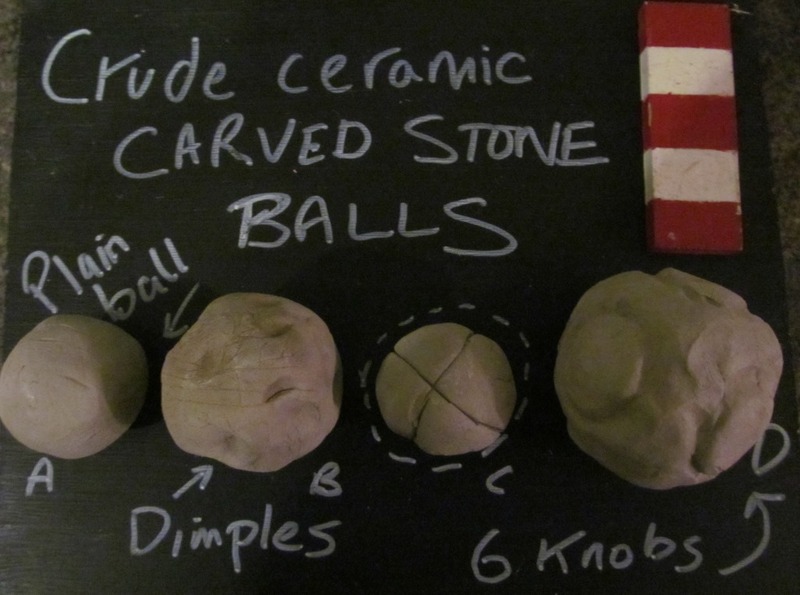 The crappy unfired ceramic balls above are my attempt to replicate carved stone balls, testament to the enduring power these enigmatic and – yes – mysterious objects still have. They inspire archaeologists too, not just artists, whether through Alice and Aaron’s Skara Brae work, or my crude potting, or a friend of mine (another archaeologist) who has three carved stone balls tattooed on his back. CSBs in all of their variants, whether real or imagined, continue to inspire archaeologists and artists and people across the world. And there is another thing, perhaps. Metallic and granite carved stone balls suggests a certain timelessness in the CSB form: as a concept, it seems indestructible, just as most of the originals seem to have been. And they also have a science fictional quality, time capsules from the ancient past, yet hinting at a weird alien future. It is always interesting when inspiration in a thoroughly urban context is drawn from the puzzles of prehistory. Sources: I was accompanied on my trip to First Conundrum by Jan, Meli and the esteemed Dr Mills, all of whom consented to have their photos included in this post, despite their facial expressions. The quote at the start of this post came from David Zink’s 1978 book The Stones of Atlantis (WH Allen), page 68. Information about First Conundrum came from the artist’s own website (link in post), and this was also the source of the fountain photo and the image of the artist. The carved stone ball images came from the Ashmolean museum (photo) and Dorothy Marshall’s article on Carved Stone Balls in the Proceedings of the Society of Antiquaries of Scotland vol 108 (line drawing). Information (and quotations and images) related to the Sconestone came from the webpage for this project (link in post) and I am also grateful to Warren Macleod for previous correspondence on this strange object. 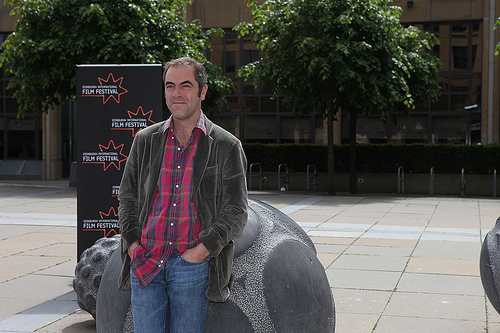 The Louise Tait information and image came from her website while the James Nesbitt photo came from the website of the Edinburgh Film Festival. Thanks to Gavin for showing me his tattoos!